To make the website Cancerinformation grow into Sweden’s largest cancer information site. The website Cancerinformation (now Kampen mot cancer) is owned and operated by Appelberg’s sister agency Mediaplanet. The site is a content marketing platform used by advertisers to spread cancer information to relevant target groups. The site already had a relevant stream of visitors, but we saw the potential for developing it into Sweden’s leading information hub about cancer. 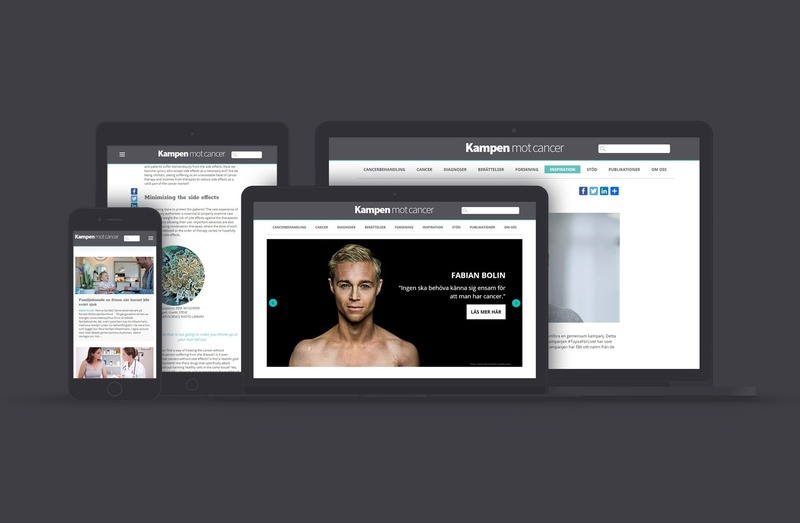 The group sister companies Appelberg, Mediaplanet, N365 and Newsner joined forces to transform the relatively unknown website Cancerinformation into Sweden’s leading site about fighting cancer, Kampen mot cancer. The name change was made to create a more dynamic and powerful site name. The combined strengths of the four companies were utilized for this assignment. Appelberg’s experienced design team gave the site a completely new look. One important change was the introduction of infinite scroll, so readers could easily access more content than just the article that initially attracted them to the site. Mediaplanet and N365 created content and managed publication on the site and the Facebook page. Frequency increased to at least one new post per day. The content is a mix of touching stories, new research and fact-based tips. With the help of Newsner’s enormous reach, the posts gained momentum on Facebook and organically reached several hundreds of thousands of people. N365 monitored how the material performed and optimized it. They also managed advertisements on Facebook, ensuring that the material reached relevant target groups. Kampen mot cancer became an immediate success after the launch in late autumn 2017. After 6 months it reached the goal of becoming Sweden’s largest cancer information site. Traffic increased by 5,090 per cent after the new site launched. On average, Kampen mot cancer has 350,000 page views a month. In addition, visitors’ average time on the page is high, about 2.5 minutes. Together, Mediaplanet, Appelberg and N365 make up Europe’s largest media company within content marketing. We are more than 500 employees in 15 countries and we help over 15,000 customers to succeed in their editorial communication. The combined experience of our three companies enables us to provide strategy, production and distribution for both the B2C and B2B markets. We can help you with anything from individual campaigns focusing on direct conversion to long-term and sustained branding. Previous ProjectHow to make it in Almedalen – be prepared and partner up. Next ProjectRecycling made beautiful – a mindful film about Scania’s next gen cab.